With the explosive growth of the Internet and broadband communications, we now have the potential for a truly democratic media system offering a wide variety of independent sources of news, information, and culture, with control over content in the hands of the many, rather than a few select media giants. But the country’s powerful communications companies have other plans. Assisted by a host of hired political operatives and pro-business policy makers, the big cable, TV, and Internet providers are using their political clout to gain ever greater control over the Internet and other digital communication channels. Instead of a “global information commons,” we’re facing an electronic media system designed principally to sell to rather than serve the public, dominated by commercial forces armed with aggressive digital marketing, interactive advertising, and personal data collection. 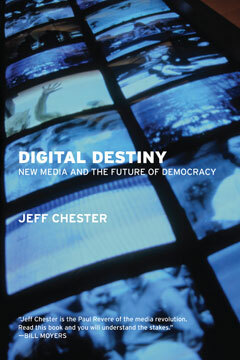 Just as Lawrence Lessig translated the mysteries of software and intellectual property for the general reader in Code and Other Laws of Cyberspace, Jeff Chester gets beneath the surface of media and telecommunications regulation to explain clearly how our new media system functions, what’s at stake, and what we can do to fight the corporate media’s plans for our “digital destiny”—before it’s too late.